Tereza Hluskova broke down as her sentence was read. 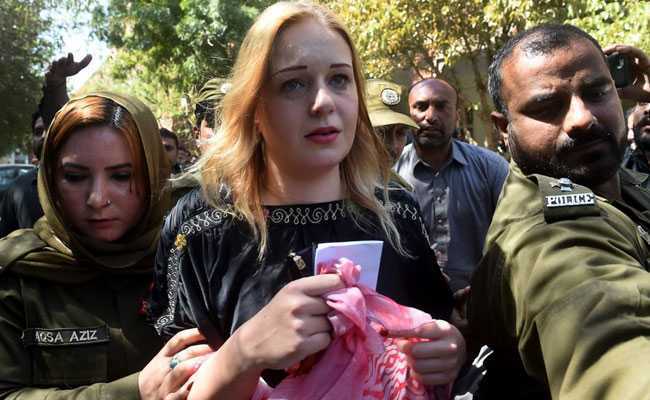 A Pakistani court sentenced a Czech national to over eight years in prison, more than a year after being arrested in the eastern city of Lahore for trafficking eight and a half kilograms of heroin. Tereza Hluskova — a 22-year-old model — has denied the charges and announced plans to file an appeal against the decision following the court’s decision on Wednesday. “We will file an appeal against the decision because I am sure that she has a very strong case, and hopefully, god willing… she will be acquitted from the charge,” her lawyer Sardar Asghar Dogar told AFP Thursday. Drug trafficking is considered a serious offence in Pakistan and arrests at airports with such cases are not uncommon. Pakistan shares a long porous border with Afghanistan, which is the world’s largest illicit opium producer despite a decade of costly multi-billion US and international counter-narcotics programmes. The country is also part of the smuggling routes to Central Asian countries with the restive tribal areas on Pakistan’s border with Afghanistan convenient routes for traffickers to smuggle in narcotics undetected.